There are a number of different fibers in this image that are used in clothing. This photo is from a tapelift collected in an office environment. 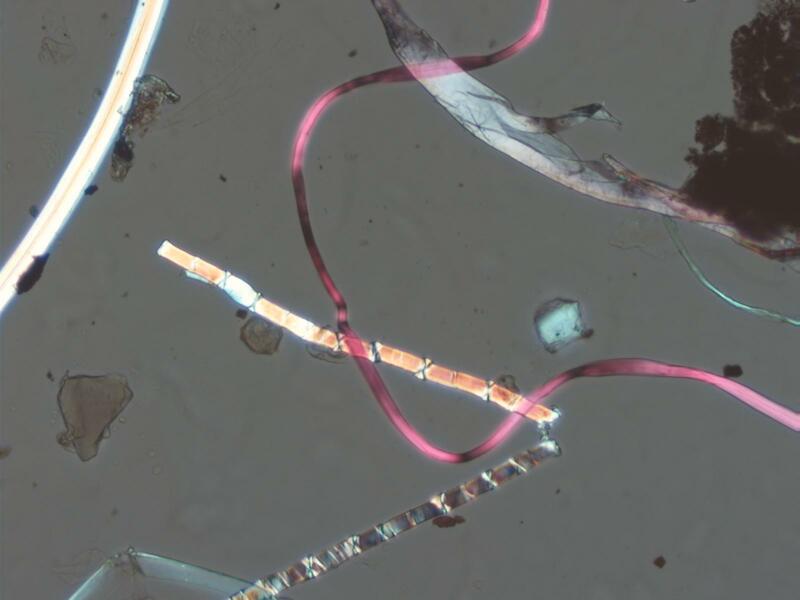 The fibers all show some mechanical damage and are from the clothing worn by people in this office or from carpet, upholstery, or other textiles that may be present. A blue mercerized cotton fiber can be seen running from the top center to the right side of the photograph. A red rayon fiber snakes in from the right and exits out the top of the frame. A linen fiber with its Charicteristic nodes ("Y's" and "X's" across the fiber) forms a lazy "v" in the lower half of the image. A wool fiber comes in from the left and exits out the top of the frame.